Named in Honor of Hank and Becky Conn (pictured), who made a generous planned gift for the University of Louisville’s Speed School of Engineering to establish the Conn Center for Renewable Energy Research, this Society recognizes alumni and friends who have included the University of Louisville in their philanthropic plans through various types of planned giving. Among these are outright bequests, gifts of appreciated assets, gifts of retirement plan assets, gifts of life insurance, and gifts created by life-income agreements and trusts for all purposes consistent with the University’s mission. More information on these ways to give may be found by exploring the links on this website, or by contacting plannedgifts@louisville.edu or kathryn.sides@louisville.edu. 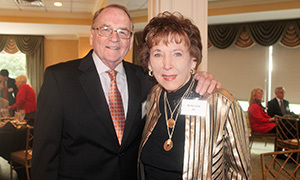 Each year, the Conn Legacy Society hosts an annual recognition dinner. The 2018 dinner, held in the windowed ballroom of the expanded Student Activities Center on the Belknap Campus, featured a keynote address from UofL President Neeli Bendapudi. Photos are here. Each year, the Conn Legacy Society also hosts two informal regional events. Photos may be viewed here from the Fall 2017 motor coach tour of the Belknap Campus, narrated by local historian Tom Owen, which was followed by a cheese and wine reception at the University Club. In Spring 2018, Robert P. Friedland, MD, professor of neurology at the University of Louisville School of Medicine and director of UofL Physicians' Memory and Alzheimer's Center, offered an informative session on "Memory Loss and Aging." Events for 2018-2019 will be posted here as they are announced.